In Security User Group, click on the permission checkbox. If a lock date can be set for the permission, this window will open. Security lock dates are date limitations that can be set for specific permissions. 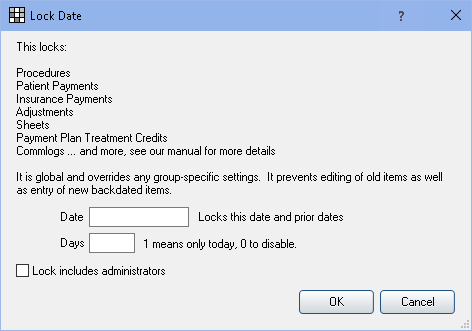 By setting lock dates, you can prevent users from editing historical data or backdating new items. Lock dates can be set by user group or globally. If both user group and global lock dates are set, the more restrictive lock date will apply. Existing Other (EO) and Existing Current (EO) procedures are not considered in lock dates. User group lock dates are date/day limits set by permission. The limit is based on the date the item was entered, not necessarily the date that shows in the patient account. For example, you can only allow users to change insurance payments if they occur within a set amount of days or after a specific date. Date: Changes will only be allowed if they are newer than the date entered. Days: Changes will only be allowed within a set amount of days from the original entry date. Global lock dates bundle multiple permissions into one setting. Global lock dates prevent editing of old items and are the only way to prevent backdating of new items. See the full list of Security Permission Details to identify which permissions are affected by global lock dates. In the Main Menu, select Setup, Security, Settings, then locate the Global Lock Date section. Date: Locks the date entered, as well as prior dates. A typical date might look like 12/31/2018. Lock includes administrators: To apply the limitation to users in the Admin user group, check this box. Note: If setting global lock dates, we recommend showing write-offs in reports using insurance payment date. See Show Insurance Writeoffs.